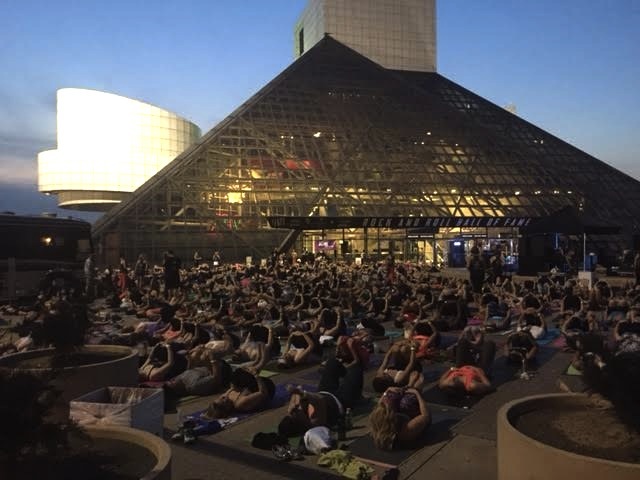 I did another Believe In CLE yoga event last Friday at the Rock and Roll Hall O'Fame - a kick-off to the Labour Day weekend. Maybe it's my last one, maybe not. I might say that every year. I might mean it every year. If you wanted to wipe out the the largest group of the whitest women (ages 35-49) in the world, this would be the place - and they'd all be wearing yoga pants and drinking coconut water while it happened. I will say - this event wasn't as bad as the last two for at least one reason. They do have a local speaker go on (and on and on) at the beginning, letting us know how great Cleveland is. Either they've all been given the same talking points, their perspective is all the same, or there is nothing new to say under the sun. But a city councilman was up this time and he made it brief and we got into our practice. So score 1 for him. Though one of the instructors went on and and and on about the GOP convention here - like it was a good thing to have Republicans here. But she's from Westlake (which can be fairly conservative), so it wasn't really a surprise. Her imitating a stereotypical Puerto Rican woman (ala Rosie Perez) was a surprise....and offensive. Even to me! Secretly, all day I was praying for rain, so it would give me an excuse not to go. Two people bailed on me earlier in the day - and I kind of envied them for doing so. Still, with the temps hitting 90 and little breeze, I made my way downtown, all by my lonesome. I knew plenty people down there who asked me to practice with them, but I wasn't really feeling it. And by 'really feeling it', I just fibbed and said I was waiting for a buddy and found a place on the outskirts to do my flow by myself. The practice itself was better than last year, but maybe not as good as year one. The music was definitely better than the last two years, but had someone put on a K-Tel compilation record from 1973, that would have been better than the previous two playlists. The weather cooled slightly, but there was a breeze of the lake, so it wasn't as oppressively hot as it has been these last two weeks. I enjoyed myself more than I thought I would. And I was happy to just be able to pick-up my mat and leave after the fact. No chit-chat. No making plans (or excuses) when it came to getting a bite to eat afterwards. "They" say there were 2000 people there, but I don't think it was that many. First year there were about 1100 and last year "they" said it was 2200. Miraculously, at this session, they said over 3000 were there last year. "Someone" needs to learn how to count. Everyone has to sign-in, so it's not that difficult to get a fairly accurate count. Sure, some stragglers get through without putting pen to paper (I saw a woman and man pull up on a motorcycle, she got off practiced in the street, while he, in all leathers, watched), but not 800 of them. Oddly enough, no food trucks this year. Maybe it was due to the holiday weekend. Maybe the group didn't really patronize the trucks last year enough to make it worth their while. I know I didn't purchase a thing. I was happy to get home and have a very late dinner with 710 while Petey intently watched what he wasn't getting. So, since I didn't decide to go to this until 75 minutes before it started, I can't say whether I'll go to the next one. As me 60 minutes before that one starts.